Junipers are coniferous evergreens that tolerate up to at least 80-percent shade. They grow more in sunny areas, but gardeners can grow junipers in the shade. They come in many forms, including trees, shrubs and spreading shrubs that work as ground covers. 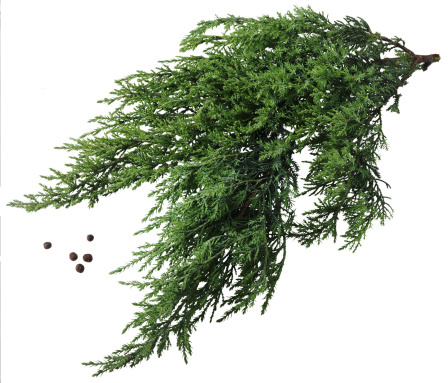 Junipers make excellent wind-breaking plants for around a home or garden, and their low light requirements allow gardeners to grow them on mostly shaded northern sides of buildings. They survive droughts well and grow in a variety of climates as long as their soil has good drainage. Junipers have a green or bluish coloring. Dig a planting hole three times as wide as the tree's roots but equally as deep as the trees depth in its starter pot. Remove the starter tree from its burlap ball or starter pot. If the tree does not come out from the pot easily, grab it by its base and gently wiggle it to loosen it. Place the juniper in the planting hole so that it sits at the same depth as it sat in its pot. Fill the hole back in with a mixture of the displaced soil and compost, using up to 20 percent compost in place of soil. Water the tree immediately with enough water to soak all the way through the soil to the deepest tree roots. Prune or remove some nearby plants or trees if they block more than 80 percent of the juniper's light. Although junipers tolerate very shady conditions, they cannot grow in full shade. Place a wire cage around the tree to help shelter it from rodents and hold it upright. The UK Forestry Commission warns that rodents often damage small juniper seedlings, and the plants benefit from some protection and support. Wire tomato cages or sturdy wire formed into a cylinder will work to support the tree, and the gardener should stick the base of the cage 6 inches into the ground to make sure it stays sturdy. Apply a 2- to 4-inch layer of mulch around the base of the tree to help the soil retain moisture and stay a more consistent temperature. Water the juniper for the first few years of its life if its soil becomes dried out a couple inches beneath the surface. In most areas, the gardener will only have to water the tree during warm seasons when it does not rain for a couple weeks. Remove the wire cage either when the tree starts to outgrow it or after at least a couple years, when it seems strong enough to stand upright despite the strongest winds in the area.